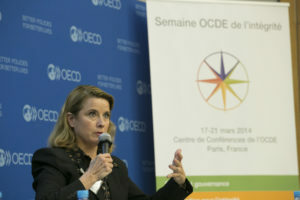 Viviane Schiavi, Senior Policy Manager of the ICC Commission on Corporate Responsibility and Anti-corruption, joined criminal law and criminology professor Mark Pieth, former Chair of the Organisation for Economic Cooperation and Development (OECD) Working Group on Bribery in International Business Transactions, and others as a speaker at the OECD Forum on Integrity that took place last week in Paris. Through the work of the its Commission on Corporate Responsibility and Anti-corruption, ICC plays a leading role in the development of ethics, anti-corruption and corporate responsibility advocacy codes and guidelines, amplifying the voice of global business in this rapidly evolving field. Ms Schiavi oversees the work of the commission, which has developed a practical suite of anti-corruption tools for business which includes ICC Rules on Combating Corruption and ICC’s Guide to Responsible Sourcing. The 2014 Forum on Integrity which took place on 19 March gathered country officials as well as experts from the OECD, international organizations, businesses and civil society, to examine the latest developments on projects relating to anti-corruption and integrity building. The OECD and its CleanGovBiz initiative actively supports governments and organizations to strengthen integrity, build trust and fight corruption. On this occasion, the OECD brought together different stakeholders to engage in dialogue on policy, best practices and recent developments in the fields of integrity and anti-corruption. Taking part in a panel session on the role of intermediaries in fighting corruption, which considered the mechanisms that should be put in place to ensure integrity in the fulfilment of their functions, Ms Schiavi reported on ICC’s new Ethics and Compliance Training – launched in 2013 as the latest addition to ICC’s suite of pragmatic tools to help business drive integrity in business transactions – and unveiled ICC’s upcoming Business Ethics Programme. Because corruption threatens the integrity of markets, undermines fair competition, destroys public trust and undermines the rule of law, ICC combats corruption in line with its mission to promote open and fair cross border trade and investment. ICC was the first international business organization to issue a set of rules and recommendations on prohibiting bribery in business transactions. Most recently ICC has continued to urge G20 leaders to follow through on their pledge to work with business in combating corruption and continues to develop tools that provide guidance on a range of related issues including gifts and hospitality.